After 32 years of experience in the refrigeration industry, we have learnt a thing or two about commercial refrigeration in Adelaide. We know which refrigeration unit is right for your shop, warehouse or factory. We know the best way to set up your refrigeration system so that it saves you money by using less power, and so that you won’t be spending money on repairs and spoiled product. We know how to set up refrigeration of all kinds: from short-term storage of foodstuffs (~4°C) to longer-term frozen storage (≤0°C). We have extensive experience with all kinds of commercial refrigeration jobs. We do commercial refrigeration repairs, installations, inspections and upgrades, just to name a few. For any kind of commercial store or business and for any kind of refrigeration job, Shiraz should be your Number 1 choice. Keep up morale in the office by hiring us to install a refrigerator that is right for your office space. We take into consideration space-availability and capacity requirements. If your refrigeration starts to fail on your business, this can mean big consequences. That’s why Shiraz is always ready to respond quickly to businesses who need their refrigeration repaired. Shiraz has the experience to handle even the largest-scale factory refrigeration jobs. Your factory may need 400 cubic feet of refrigerator space; your factory may need entire cool rooms. We excel at installing refrigeration at this scale. We are a company that is experienced in catering for clients who need vast amounts of product refrigerated. We can install any number of refrigerators, freezers or cool rooms in your warehouse to keep your product fresh. 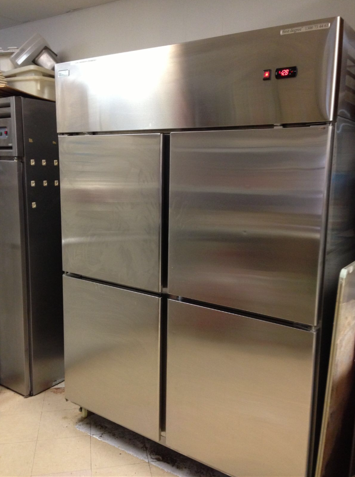 We will fit your restaurant with the right fridges for storing foodstuffs of the quantities that you require. E.g. if you are a seafood restaurant you need lots of freezer-space. How much money are you betting that your business’s refrigeration keeps working? The amount of perishable product in your fridges equals this amount. That’s why it can save you a fortune to get your fridges checked up by us at regular intervals, just like you would with any important machine (including your car). If you’re starting out in business or if your business needs a makeover, having the right type of refrigeration for your staff is a major step in making sure your business succeeds. It doesn’t matter if it’s a shop, food retailer, factory or whatever, the right type and size of refrigeration is essential. Do you know the needs of your staff and, if you have them, your customers?What capacity of refrigeration unit or units do you need? This is where the experts are a real benefit to your business. You need to be able to cater for the needs of your people and an expert in commercial refrigeration can provide you with expert guidance. They know the trade, and the range of refrigeration units on the market. They can guide you on not just the size and model of refrigeration unit but on its placement within your premises. You don’t want to be making unnecessary journeys simply by placing the unit in the wrong location. It doesn’t matter if you have just the one refrigeration unit or something much larger, even a cool room, being able to call on expert refrigeration mechanics at short notice is a huge plus for your business. Put the phone number of your professional fridge mechanic on your fridge – where else? – knowing that at the first sign or trouble, your one call can get prompt professional service. It’s well worth thinking about a maintenance contract where regular service will keep your refrigeration units in smooth working order. Think of the value of the goods inside your commercial refrigeration. Keep it safe within your reliable refrigeration equipment.